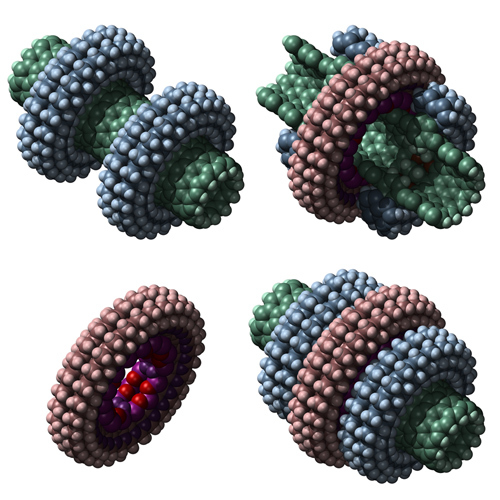 Peter Kutchukian, a current graduate student in the Department of Chemistry and Chemical Biology at Harvard, has started a new nanotechnology-related art/gallery site, www.nanohedron.com. As part of his first content round, which include a number of experimental, computational (myself included), and purely artistic nanoscale images, Peter requested a few from my gallery, which I was delighted to submit to his site. Included are the bearing assembly (below) and the ever-popular fused diamondoid single-walled carbon nanotube van der Waals crimp junction. 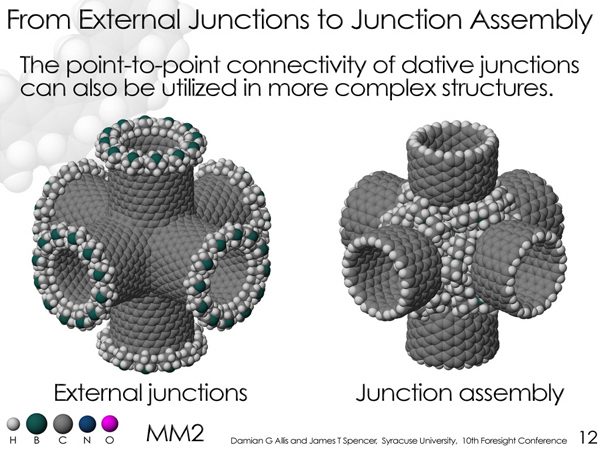 His interest in some of the carbon nanotube/dative bond designs in the gallery also motivated me to finally repost the slides from my first nanotech talk, The Design of Carbon Nanotube-Based Dative Structures from Supramolecular Principles, at the Foresight Nanotech Institute 10th Conference on Molecular Nanotechnology from way back in 2002.